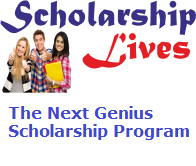 The Next Genius Scholarship Program Eligibility · Class 10th who is in Grade 12 (or gap year). · Applicants must be An Indian citizen, a PIO card holder, or the student of an Indian High School. First, complete the basic profile. Then online critical thinking assessment fixed date. After that the value of one’s ability through this assessment channel as directs to read effectively, reason, analyze data etc. The candidates, who have clear the first round get Shortlisted from Level 1, will be directed move to level 2 as the personal interview. Now Fill in the all the details, take print out for the next process.